FORT COLLINS, Colo., June 5, 2018 /PRNewswire/ -- Everyone tells a unique story through style. While looks can change every day, there is one thing you carry daily: a smartphone, making smartphone cases the ultimate accessory. Carefree and chill, reserved and strong, delicate and elegant – no matter your style, OtterBox has you covered with new Symmetry Series case designs available exclusively at Target. Designed to match your summer vibe, these Symmetry Series designs feature marbled gloss, flirty lace and opalescent hues in colors ranging from bold to demure and everything in between. Symmetry Series is easy to slip on and off iPhone with ease, so you can change your case to match your outfit or your mood. "It's been a dream working with Target on designs that allow people to show off their personal style," said OtterBox Style and Design Product Manager Laura Felix. "Whether someone feels as mysterious as a unicorn, as cosmically connected as a wizard or just straight up elegant, we've got them covered. We've been inspired by the fashion-forward whimsy of Target." 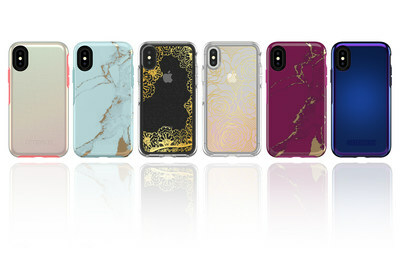 OtterBox and Target designers came together to create this attractive lineup that feature six unique designs, including opalescent colors for the first time on an OtterBox case. These new Symmetry Series cases are available exclusively at Target for iPhone 7/8, $44.95, iPhone 7/8 Plus, $54.95, iPhone X, $44.95, iPhone 6/6s, $44.95 and iPhone 6 Plus/6s Plus, $54.95. For more information, visit otterbox.com. To purchase, visit a Target store or target.com.